I am a great admirer of Cindy Crawford. She has aged with such tremendous beauty over the years and is a role model for many women as she demonstrates the ability to be both mother and businesswoman. When I 'liked' her Facebook page, I noticed she often uploads photographs of herself, taken by a certain Herb Ritts. 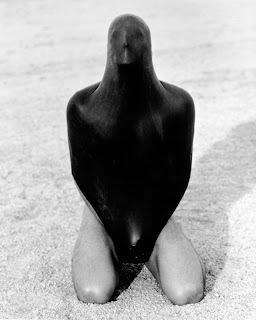 This got me intrigued and so I one day took the time to begin my exploration of the photographic world that belonged to Herb Ritts. What I find even more fascinating, is his literal use of black and white colours.Take the last photograph in this slide. A caucasian woman dressed in a black dress with the rest of the fabric structurally flowing around her, set against a white background. This is in fact my favourite photograph by Ritts; the echo of the feminine curves on her back made by the fabric, the contrast of the curves set by the black and white colours, the use of shadows on her neck etc. There is, to an extent, symmetry throughout the image. And, it is beautiful.